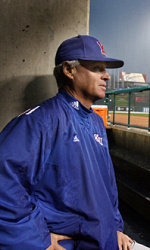 The University of Kansas baseball team will play a tough schedule in 2010 that includes 30 contests against teams that qualified for the NCAA Tournament last season. KU will play 13 games against teams ranked in Baseball America’s 2009 final Top 25 poll, including Louisiana State and Texas, the clubs that participated in the College World Series final. The schedule, announced Thursday by Head Coach Ritch Price, also includes 25 games at KU’s Hoglund Ballpark, one at historic Rosenblatt Stadium in its final year of existence, as well as one at Kauffman Stadium – home of the Kansas City Royals. Kansas opens the season at home for the first time since 2002, with a three-game series against Eastern Michigan, Feb. 19-21. KU’s annual game against Wichita State in Lawrence will be Feb. 23, wrapping up the team’s first homestand of the year. KU will participate in the Peoria Spring Training Classic in Peoria, Ariz., at the spring training home of the Seattle Mariners. After one game at 2009 College World Series participant Arkansas in Fayetteville, the Jayhawks return home to host Iowa and Tabor, before a grueling stretch that ends with the Big 12 series opener at Baylor, March 26-28. Between March 12-28, the Jayhawks will play 10 games away from Lawrence, including a three-game series at Alex Box Stadium in Baton Rouge, La., against defending national champ, LSU. After a five-game homestand to start the month of April, the Jayhawks will be on the road for nine-straight contests, beginning with a non-conference game against Creighton at Rosenblatt Stadium on April 7, and ending with a non-conference match up with Missouri at Kauffman Stadium on April 21. Following the Missouri game at Kauffman Stadium, KU will play 10 of its final 17 games in the comforts of Hoglund Ballpark, including home series against Big 12 foes Texas Tech (April 23-25), Missouri (May 7-9) and Oklahoma (May 21-23). KU will also host in-state rival Kansas State in the first game of a three-game series. “Our 2010 schedule will prepare our team to compete in the Big 12 Conference and, if we’re successful, our RPI should qualify our team for the NCAA Tournament, and help us reach our goal of being a Top 25 program,” Price said.